Protesters march on the UCLA campus Monday in Los Angeles, demanding solutions to gender pay inequity and higher wages. It was the first of three days of walkouts by service workers at University of California campuses. Thousands of service workers marched on campuses across California on Wednesday, marking the final push of a planned three-day strike that began earlier this week. 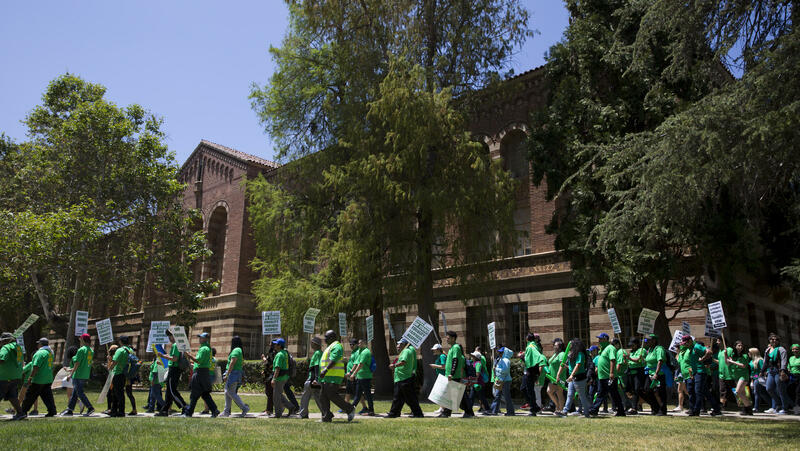 Custodians, cafeteria staff, truck drivers and nurse's aides, among others, took up signs and slogans to call attention to their floundering contract negotiations with the University of California system. "They need to know that we're the care providers," said nurse's assistant Reyna Avila, who joined the picket line in front of UCLA's medical center, "and we're the one that makes them make the big bucks." The American Federation of State, County and Municipal Employees Local 3299 authorized the strike last month after a year of fruitless bargaining. With more than 20,000 service workers, the group represents the state university system's largest union, and its members are calling for an annual pay raise of 6 percent and the freezing of health care premiums. They are also protesting a bump in the retirement age from 60 to 65, as well as the practice of outsourcing work to non-union — and generally lower paid — workers. And so, they donned green and gathered with signs in hand on 10 UC campuses and five UC medical centers, beginning early Monday. Nurses and technical unions joined the AFSCME action with a sympathy strike Tuesday, adding about 29,000 medical staff to the number of workers already on strike. Avila, for her part, decided that striking three days without pay is worth it if it draws attention to workers' personal situations. Both she and her husband work at the hospital. They have only one car and a long commute. His shift starts at 4 a.m., hers at 7 a.m., so she sleeps in their car until her shift starts. They're also struggling to afford to put two kids through college. "It's a sacrifice," she said, "and it's a double sacrifice that we're both here." AFSCME President Lee Saunders cast it as a fight for respect in an environment that privileges school administrators and professors over service workers. "For their commitment to public service, they deserve the respect of fair wages and fair treatment," Saunders said in a statement Tuesday. "Instead, they are held down by a system of entrenched inequality that's driven by outsourcing, with women and workers of color paid substantially less than their white male peers, and a disproportionate share of pay increases going to the wealthiest university officials." Claire Doan, spokesperson for the University of California, sees the matter differently. She says that the service workers already have good health care benefits, paying on average about $20 a month, and their demands for a 6 percent annual raise can't be justified to taxpayers. The university first offered a 3 percent raise and when the union didn't agree, the university gave the workers 2 percent. "All they've done is hurt care for our patients and our students," Doan said. As KQED's Shia Levitt noted Tuesday on Morning Edition, thousands of patients have had to reschedule their appointments at UC San Francisco's medical center alone. That includes "12,140 chemo treatments, radiology procedures, outpatient surgeries that have been impacted and had to be rescheduled," the center's senior vice president, Sheila Antrum, told Levitt. "Just in general, a major disruption." And one that has not convinced UC administrators, Doan said. "It's done nothing, this strike, to change our position on their unreasonable demands for their excessive raises and benefits," she added. Still, strikers such as physician's assistant Scott Gilliam, who picketed Wednesday outside the UCLA hospital where he's worked for 18 years, intend to sway more than just the particular points of the dispute. He says that across California and the country, wages for the highest-income earners are going up and up, while those at the lower end are mostly stagnant. "The raise is not my issue. It's the fact of inequality itself," Gilliam said. "If they want better quality care, they need to take care of us, so we can take care of the community." The union members expect to head back to work tomorrow morning. But they have warned that, depending on how the resumed contract negotiations unfold, they are ready to walk out again if necessary. Today is the third and final day of a strike by service workers at 10 University of California campuses. Thousands of nurse's aides, dining hall workers, custodians and others are walking off the job. This is the latest saga in a year-long wage dispute. NPR's Kirk Siegler reports from one of the larger strikes on the campus of UCLA. UNIDENTIFIED PROTESTERS: (Chanting) Shut it down. KIRK SIEGLER, BYLINE: Chants of shut it down on the picket line in front of UCLA's Ronald Reagan Medical Center - members of the University of California's largest union, the American Federation of State, County and Municipal Employees, are holding signs reading second-class workers. SIEGLER: Reyna Avila, a nurse's assistant, is wearing a green T-shirt that says we run UC. REYNA AVILA: UC - they need to know that, you know, we're the care providers. And we're the one that makes them make the big bucks. SIEGLER: The union wants a 6 percent raise instead of the 3 percent the university originally offered. They're also angry over the raising of the retirement age from 60 to 65, and they want health care premiums frozen. AVILA: If nothing is resolved, we'll continue to keep fighting until we get a fair contract. SIEGLER: Avila decided striking three days without pay is worth it if it draws attention to workers' personal situations. Both she and her husband work at the hospital. They have only one car and a long commute. His shift starts at 4 a.m., hers at 7 a.m. So she sleeps in their car on campus until her shift starts. They're also struggling to afford putting two kids through college. AVILA: It's a sacrifice. And it's a double-sacrifice that we're both here. SIEGLER: Union workers say they've put contingency plans in place for medical emergencies, but thousands of medical appointments, including things like chemo for cancer patients, have had to be rescheduled at UC hospitals from Southern California to the Bay Area. UNIDENTIFIED PROTESTER #2: What do we want? SIEGLER: Yesterday, nurses and technical unions also joined the walkouts in a sympathy strike. That's caused a yet untold number of additional disruptions. CLAIRE DOAN: There is no denying that it's definitely had a negative impact on the public and on the people we serve. SIEGLER: Claire Doan is a spokesperson for the University of California, which is calling the three-day walkout ill-advised. She says the service workers already have good health care benefits, paying on average about 20 bucks a month. And their demands for a 6 percent annual raise can't be justified to taxpayers. DOAN: All they've done is hurt care for our patients and our students. It's done nothing - the strike - to change our position on their unreasonable demands for excessive raises and benefits. SIEGLER: It's not clear how effective this large service workers strike will be. It does follow the recent highly publicized teacher walkouts in other states. And it's happening as nationally unions had been seen as declining in both influence and membership. SIEGLER: Right now, the university has imposed even less of a pay raise as the labor dispute has dragged on. But at least some of these picketers here see a bigger cause. Scott Gilliam has worked as a physician's assistant at the hospital for 18 years. SCOTT GILLIAM: The raise is not my issue. It's the fact of inequality itself. SIEGLER: Gilliam says across California and the country, wages for the highest income earners are going up and up while those at the lower end are mostly stagnant. GILLIAM: If they want better quality care, they need to take care of us so we can take care of the community. SIEGLER: Gilliam says union workers are prepared to strike again with 10-days' notice if a better contract isn't hammered out. Their current strike ends early tomorrow morning. Kirk Siegler, NPR News, Los Angeles. Transcript provided by NPR, Copyright NPR.